The wild state of Alaska. Land of the last frontier. Grizzly bears, salmon, the north slope and gold. Home to many old mines that made fortunes for some. Ever since the gold rush to Nome in the late 1800's, men have been searching all over Alaska for the next big find and this is where Redstar Gold comes into the picture. When you think of Alaska and gold, most people think about Fairbanks or maybe the Kenia Peninsula. It's not to often though that we think about that string of islands that stretch out towards Russia as being Alaska called the Aleutian Islands but it's here on one of those island within the Aleutian Arc that Redstar Gold is hard at work. The most attractive feature of any precious metals project out there is probably the average grade of a project, as it might make or kill a project. When we're talking about an open pit mine we're already happy with grades of 1-1.5 g/t and an open pit mine with an average grade of more than 2 g/t is quite exceptional. But imagine there's gold and silver mineralization located near surface with an average grade of 27.4 g/t gold and 127 g/t silver, what would you think? Indeed, 'wow'. And that's the feeling we had when we started to dig deeper into Redstar Gold's (RGC.V) Unga high-grade gold-silver project on the coast of Alaska. The project will require some more drilling to highlight its potential, but Unga seems to be one of the most intriguing high-grade exploration stories out there. 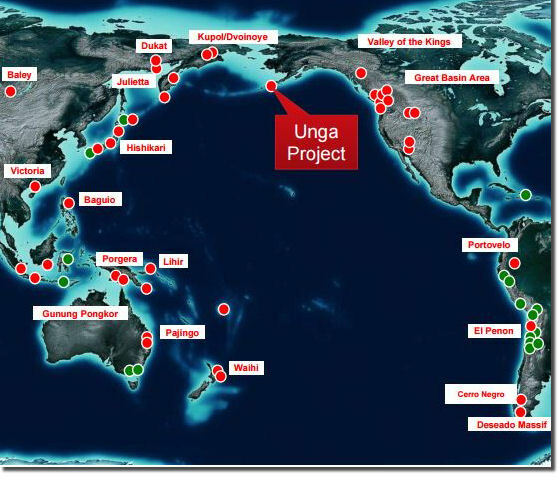 Redstar's Unga project is located on the Unga and Popof Islands. The land mass is covers approx. 240 sq km and the company owns this area 100%. These claims have some interesting geological trends which contain two prominent, linear features, the Apollo - Sitka Trend and the Shumagin Trend, running sub - parallel and about 3 km apart. Each trend is over 9.5 km in length, and both show extensive, high-grade gold mineralization. A district scale intermediate sulfidation epithermal exists across Redstar's property. Both trends were subject to a renewed exploration effort by Redstar during the summer of 2014, which resulted in a targeted drilling program on the Shumagin Gold Zone of 8 holes (1,500m) which was completed in May 2015. This trend in fact use to be home to Alaska's first gold mine. The Apollo - Sitka gold mine which is located on the southern trend with a historical reported production of around 150,000 oz of gold in the late 1800's and early 1900's. 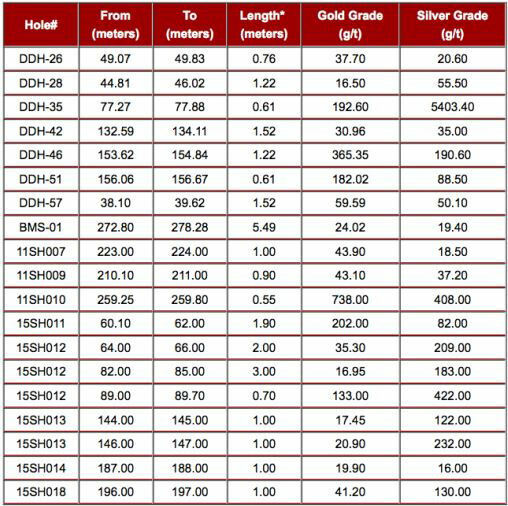 The table below shows additional grades from holes drilled by the company during the 2015 drilling program. Note some of the grades being as high 738 gr/t over 0.55 meters. The company just announced on June 8th of 2016 that it has initiated an advanced drill targeting exploration program at its Unga Gold Project, Alaska, including work programs at the Shumagin Gold Zone, and the Empire Ridge and Orange Mountain Gold Prospects. The scope of work will focus on delineation of new drill targets to expand known mineralization previously drilled at the Shumagin prospect. A portion of the program will consist of detailed structural mapping and drill targeting at Empire Ridge, the southwest extension of the historic Apollo gold mine. Select samples of exposed vein gossans are enriched in silver up to 157 g/t. Quartz vein breccias sampled at the southern most exposure of the Apollo open stope ~500 meters to the northeast of Empire Ridge returned high-grade assays of 216 g/t of gold and 74.5 g/t of silver and reconnaissance mapping and sampling will also focus on obtaining drill targets within lithogically and structurally controlled silicification at Orange Mountain. The company has it's head office in Vancouver BC and it's shares trade on the TSX Venture exchange. At this time the company has 218 million shares outstanding. The 52 week trading range has been 2 cents low and 7 cents high. Today there are thousands of junior mining companies to invest in. With the recent rebound in metals and gold in particular, investor taste for these kinds of investments have turned positive. Prudent and contrairian investors know all to well that these kind of investments run in cycles. Knowing these cycles there is no doubt that the world has seen the bottom of the bear cycle and the time to look at investing in these types of investments is now. Investors who understand this will be active in evaluating companies and projects that have a lot of positives and this is a catagory that Redstar is in. Here's a quick list of positives for Redstar Gold Corp. Location! Although remote this area is served by deep water port and nearby air strip. Existing older mine with proven mineral resource. On going work with 2016 summer drill program underway. To find out more about Redstar Gold Corp. and this project, Click Here to visit their website. There you will find all an exstensive amount of information along with contact information.